U.S. Coast Guard 17th District Alaska Jul 12, 2018. 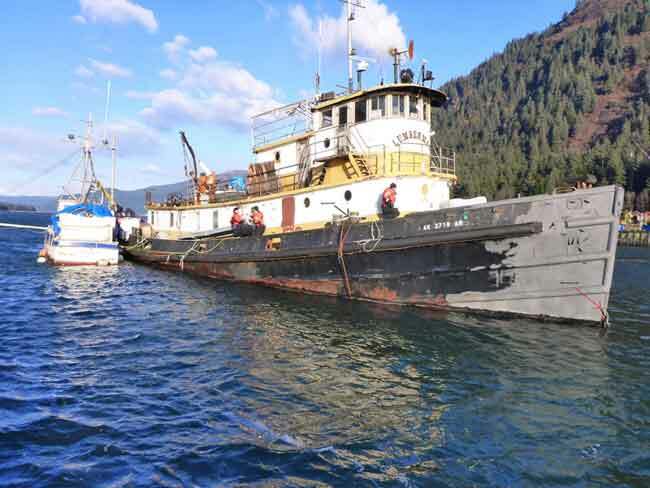 JUNEAU, Alaska — The Coast Guard is working alongside state and local agencies to determine the path forward for the tug Lumberman anchored in the Gastineau Channel of Juneau. Representatives from the Coast Guard, Alaska Department of Natural Resources, Alaska Department of Environmental Conservation, Alaska Department of Law, City and Borough of Juneau and the Army Corps of Engineers met again on Friday to discuss future actions. The vessel currently resides on DNR’s jurisdictional tidelands and DNR is exploring all options for a safe disposition of the vessel, a 200-ton World War II-era tug. The vessel has become a safety concern in the Gastineau Channel north of the bridge to Douglas Island. A joint boarding by the Coast Guard, Juneau Police Department, and CBJ Docks and Harbors on October 22, 2017, led to the determination that the tug posed a substantial pollution risk. After working with the owner and ADEC, Coast Guard opened the Oil Spill Liability Trust Fund on January 11, 2018. The OSLTF is a federal fund used for responding to actual or potential pollution incidents. All pollution sources were removed from the vessel with the exception of a small gas can used by the owner to run his heater. Before the Lumberman broke free on May 5, 2018, it was anchored on CBJ jurisdictional submerged lands without permission. A new CBJ ordinance, enacted in February 2018 and modeled after Alaska Statute, now enables CBJ Docks & Harbors to assert authority on vessels anchored on CBJ submerged lands. The CBJ proceedings were interrupted by the vessel dragging anchor out of the CBJ jurisdictional submerged lands and into DNR’s jurisdictional tidelands. “This is a complex case involving multiple jurisdictions, however, all agencies are working together to come to an effective resolution,” said Capt. Stephen White, the Coast Guard captain of the port. “I appreciate the leadership and engagement of all parties as we continue to work through this. While the Coast Guard has exhausted its jurisdictional authority in this case, I can honestly say that each agency is actively engaged and aligned in ensuring the environment and the maritime infrastructure is protected.”The team will focus on securing the tug in a safe location while DNR is pursuing legal avenues with the owner and other agencies to facilitate the safe removal of this risk.